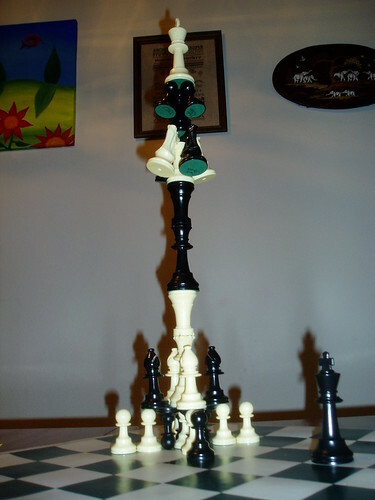 I have been stacking chess pieces for years, ever since 7th grade chess club (or did I start that in 6th grade? I can't remember). Until today, they were rather simple stacks, rooks on rooks with kings or queens at the top, and the tried-and-true four-knight-rook base. But after today, I will have a difficult time one-upping myself (and Sarah), because these stacks are amazing. Sarah and I are teh awesome.